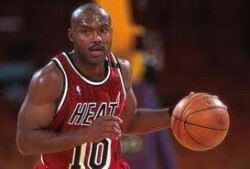 Tim Hardaway played 15 years in the NBA for the Warriors, Heat, Nuggets, Mavericks and Pacers. He was a five time all-star (twice with the Heat) and was named first team all-NBA and an MVP finalist after leading the Heat to their then-finest season in 1996-97, when he averaged 20.3 points and 8.6 assists per game. He finished his career with more than 15,000 points and 7,000 assists.